This Double SUP Stand and Cart makes storing and transporting your paddleboards easy, especially if you've got a lot of boards. 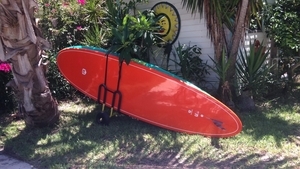 The base frame of this product serves as a freestanding rack for 2 paddleboards. But with a quick adjustment inserting two quick release wheels, you've got a cart to transport your 2 paddleboards to the water! A smart, easy to use design for storage and transport is made even better when you consider what you'll save not having to buy two separate products. Transforms from Cart to Rack: it's simple to use as either a rack or a cart! As you can see in the pictures, the cart setup has 2 wheels and storage for 2 paddleboards. Wheel your SUP to the water, and when you bring it back home, pop the quick release wheels off the cart frame, and clip the frame into a base stand, which turns the cart into a freestanding floor rack for 2 paddleboards. 2 SUP Storage Rack. With double the SUP storage capacity, this rack (or a few of these racks) is great for paddleboard enthusiasts with multiple paddleboards. No installation or mounting is required, so it's fully portable. That makes it great moving it from your garage to your deck or dock, and also for stores or shops that want the freedom to move their racks around their floors. 2 SUP Transport Cart. With double the SUP transport capacity, you and your paddle partner only need 1 cart to get your boards to the water. 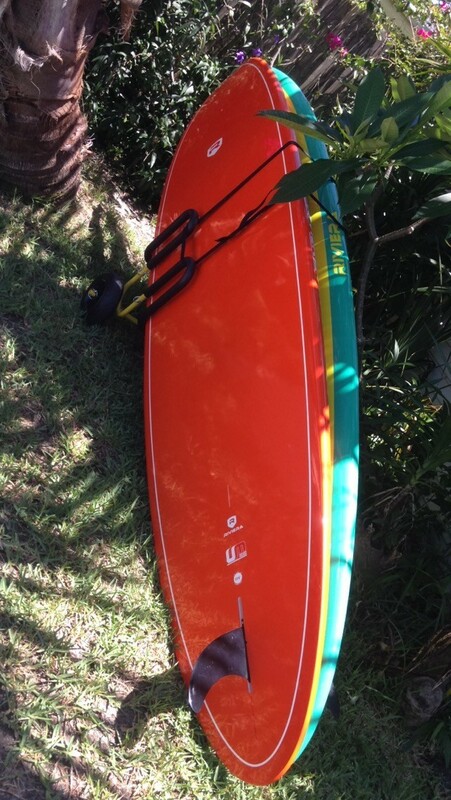 It's also great for stores or shops taking their SUPs to and from the water during the day, like SUP yoga studios, SUP rental shops, SUP schools, and expos. The Cart's wheels are 10" and are airless, which means there's no inflating, and no flats, and the rims and wheels can never rust, either. At the same time, they can handle any rough terrain you'll be traveling over to the shoreline, like sand, dirt, gravel, mulch, and more. The cart comes with an 11.5" tie down strap for stability for long distance trips or riding over extra rough terrain. Indoor-Outdoor Use. The frame of the rack-cart is made from heavy-duty Aluminum and the hardware is stainless steel, so the entire rack is rust proof - a must for any quality SUP rack. This means you can use the rack in your garage and move it in your backyard, or on your dock or deck when you want to move your SUPs. For retail use, you can display your paddleboards outside during the day and bring the racks and boards back inside at night. As a cart, you won't have to worry about leaving it outside, either. Paddleboard Protection. The Double SUP Stand has thick Neoprene covered foam arms that your boards rests on and rest between. These pads won't mark or damage your SUPs during storage. Also available separately as a SUP Cart or a SUP Stand. Want to lock up your paddleboards, your Cart and your Stand? Check out this SUP Lock system. Overall Height (from ground to top of middle bar): 34"
Overall Footprint: 18" x 27"
Width of slots (where the boards sit): 7"
Length of top middle bar: 18"
Distance from bottom of the cradle to the top of the middle bar: 22"
Overall Height (from ground to the top of middle bar): 34.5"
Overall Footprint (not including wheels): 18" x 18"
Width of slots (where the board sit): 7"
I have 2 of the mirage eclipse stand up pedal paddle boards. Would this be the best option to store them in my garage? Is it sturdy? Our double SUP cart/combo could possibly work for your Mirage Drive Pedal SUPs. You would most likely need to remove the handlebar and pedals for storage though. If will fit boards up to 7" thick, so that is one factor for you to look at, to see if these will fit the thickness of your boards. Then, as I said, you might not be able to put the boards in the stand with the handlebars and pedals on. This is the combo version of this stand, so that includes wheels that convert it into a cart. So you could use it to cart the boards, as well, down to the water, but again: most likely removing the handlebars/pedals first. If you don't really need the cart capability, here is the 2 board standwithout that. Both versions are sturdy, and economical, storage stands. My only other suggestion might be something along the lines of this 3 level Freestanding Rack, as you could remove one of the arm levels so that maybe you could position the boards with drives/pedals that way (top level having bars going upwards, 2nd level with it going downwards, say). I can't guarantee that would work, but its a thought. How hard is it to transform this item between the two options? Our SUP cart/stand combo converts fairly easily, and it is tool free to convert between the stand and the wheeled cart - but it does take a couple of steps. You need to remove the locking pins, remove the wheel base or the stand base that you want to change; rotate the part where the boards sit, and then attach the wheel base or stand you want to use. On our listing, under helpful items, there is an instruction manual that you can check out for reference if that would help; we also have a video showing its use and set-up on our listing. What is the size of the axle on this cart? The axle is 22mm in diameter! This was super easy to put together. Makes bringing our boards down to the lake so easy. Very happy with the quality. Will be converting cart to stand for the winter. Great product. I wish you didn't have to take apart to make it a storage stand...would love to use it both ways but it's too difficult for me to unload boards. just going to keep them both on the cart w wheels. This was easy to put together and worked as described. Good on-line shopping experience, delivered on time. very easy process!! I'm currently using this to store my SUP and a Kona One. Big boards both and the stand is very stable and allows for easy access. Great option! This cart easily holds my two fat SUP's. I'm 65 and can push it myself (OK, I'd rather my "kids" do it!) Amazingly, it's not too wide to go down the sidewalk, since the boards are on their sides. We haven't configured it as a rack yet. It's sturdy. We add our beach chairs and umbrella in the middle. We use it to go 3 blocks from the house to the bay. Very happy with this purchase after trying to carefully lean our boards against the house! Very sturdy and easy to assemble. Have not used it as a cart yet but we are pleased so far! The cart and stand combo works well for transporting two boards - as advertised! The switch from cart to stand takes a bit as it needs to be reconfigured, but it isn't too time consuming. The wheels compressed a bit after sitting on a hard cement surface for a week or two with one board in the cart. Overall I recommend this product. Your SUP holder was so easy to assemble - we bought the item that can be used for transport or storage. It is really a terrific item for paddle-boards as they can be awkward to store efficiently. It hugs the wall and takes little space. Best of all, it is a safer way to store them as there is no risk of falling or slipping and potentially hurting our younger grandchildren. Thanks! The cart went together very quickly & looks just like what we wanted. Since it's really cold here in Montana & we have a few months left of winter, we are not using it yet or even storing our boards on it....more to come in the spring. Great job on the design!! Makes getting to the water not such a task, only wish it came in different colors. But very nice product and simple to use. We LOVE it!!!!! It is so easy to use and store! I highly recommend it this product :) thank you guys!! !